Last Saturday I attended a day of pop up fashion at New Square! I took my vlogging camera to showcase the shows across the day, with models dancing and performing in latest collections from New Square stores including Outfit Fashion (aka Topshop, Dorothy Perkins and Miss Selfridge), JD, Next and more. I haven't vlogged in a little while so I was set with my camera in hand to capture all of the day's activities, plus get some tips from the on-hand stylist Jill on what I should be stocking up on. She also had bagfuls of vouchers to hand out to the unsuspecting audience and it was like Christmas had come again! My favourite outfits were the CUTE denim pinafore and tee from Dorothy Perkins and a bronze Topshop bomber that I've eyed up in store many a time. Take a peek below! Nicky Lazou Review - Worth the hair hype? HI! Hey! I'm here! Eeek I'm back on my blog, weird feelings all round! I've been away for a few reasons and I'll go into these in another post but after a rocky few months, the first thing that I definitely want to select from my HUGE 'to post' blog topic list is when I had my hair done by Nicky Lazou! You might already follow this balayage queen for not only the fun content but also her thumb-stopping before/after shots of 'before' hair looking brassy, frizzy and yellow next to some seriously luscious 'after' locks. I was scrolling one day and saw a girl comment that Nicky lives in Birmingham. Say what? Now this was around November time when I was about to head off to Dubai and was probably feeling super flush. I'd been blonde-ish for a while but the upkeep of highlights was putting a strain on my time and the quality of my hair, which I use heat on every day also when curling it or drying it. For the first time in around five years, I was considering going back to my ginger roots too! A big step, but if anyone could get me there, I hoped Nicky would. Now be warned: I've probably never wrote a post so passionately about hair but Nicky has relit my fire! And I'm a hair girl through and through. Growing up it was what stood out most about me, and while this might have prompted some tormenting mostly by random people in the street (nice), if you have ginger hair, a lot of people will say nice things too. I've strayed from my colour and to tried new looks, but last year I kept noticing people with such beautiful red hair and it planted the seed to go back to natural. After a few texts I'd booked my Nicky appointment and had an idea of prices. Warning: this ain't cheap, but I'll go into that later. I'm very much a person who doesn't spend without thought, but if I decide I really want something, I will find a means to achieve that purchase! I'm not impulsive but I'm not afraid to spend either, and I really wanted my hair to go right. I had a few reservations but off I went to the nearby countryside on a Saturday morning, pulling up to the beautiful setting of Nicky's space. Along with helping hands from her family, there are a few large, chic basement rooms in Nicky's home where she works here magic. I assumed I would be the only client but there are a few girls there at a time, each at different stages of dying, toning or perfecting. It's a really welcoming vibe, with girly conversation and Drake in the air. And after being there a few minutes, I realised other girls has travelled from further than London! First up is your consultation with Nicky, where I showed in a bunch of photos and discussed what my aim was - to take my top half to my natural colour and cascade blonde balayage through the middle and ends. As mentioned to most of the girls that arrived while I was there, on Instagram everyone thinks you can go from dark to light in one sitting, when in fact going from brown to blonde can take time, especially if you naturally have darker hair. Even I needed two sessions to take my colour as light as I wanted, and that's just because Nicky will not damage your hair, even if you want to pay the price for platinum. Even if you beg to go lighter than light, it won't happen. That was an overriding vibe you get from Nicky - she will not go down the road of treating you as an anonymous customer and delivering something that is going to ruin your hair down the line. She won't slap the bleach on and take you there! This was fine by me as I didn't mind having a second session in a few months if this one went well. Soon I was under foils and the process had begun! Even though it isn't a salon experience, it's actually really chilled at Nicky's and you leave feeling relaxed and fantastic. She literally preaches the hair gospel as she works by revealing tips, tricks and science behind hair, and you really start to appreciate the art that goes into this. Nicky also has thick, dry, darker hair and so she knows the advice to give. It's really inspiring to hear her hair secrets and as you are getting the 'Nicky' treatment, it feels even more special! She explained how the dyes used for my hair were especially expensive and unique too as I requested a warm, golden, honey colour, whereas most blonde stay clear of anything warm or 'brassy'. I thought she had her work cut out for her really as you can see from my 'before' picture below! As I was having my treatment, I saw the girls around me emerge with such incredible hair, literally seeing the transformation before my eyes! Soon my blow dry was complete and the change was insane! I have no idea how she took my all-over streaky hair to smooth on top and blonde on the ends?! And I'm a red head - these dyes are hard to come by. 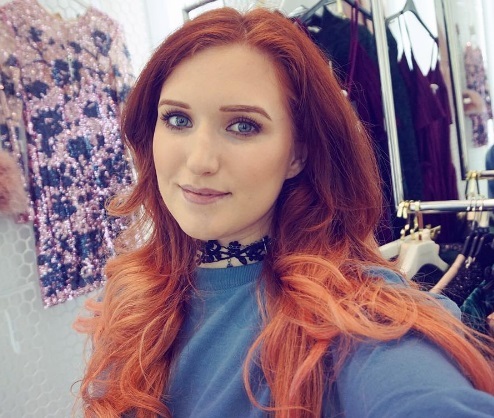 We've all seen the 'natural' red head box dyes in Superdrug that are bright orange or dark with a flash of red in certain lights. I was so pleased to have something unique again, though the colour was a touch darker than my natural hue. Nicky promised that the blonde ends would also brighten after washes, rather than going yellow after washes. I can confirm this is true; after the first few washes my blonde layers turned even more true and bright. Nicky didn't even know I had a blog before visiting (this is not a prompted review - I paid full price!) and I cannot tell you how just lovely and open she is naturally, and so complimentary and sweet. She treats each customer like their hair is a precious jewel in her hands and the goal is always to do something that she knows is a beautiful style, as after all, it's her name attached. I also returned a few months later to take my roots to my lightest, most natural colour, and the ends even more sun-kissed for spring. Nicky and her sister remembered me which I was so surprised about as they see so many girls, but the repeat customers do speak for themselves, and many girls while I were there had been multiple times. Her sister adds so much to the team too - she's just fabulous. Now I have the colour of dreams! I have not touched it for months and never need to because it will just grow out - there are no roots! This is the beauty of balayage. Are you considering visiting Nicky? First I would manage expectations and consider how many sessions you would need to get your desired colour. Consult a few salons and think about if it's money you won't regret, as it will set you back a few hundred pounds. Balayage is all about the subtly, and we're so used to seeing a major contrast of hair colours that ombre gives, keep in mind that balayage tricks the eye - the top and bottom colour are totally different yet the result is so seamless that most people will not be fixated on the transition, and may not even notice! But hair looks thicker, glossier, lighter, and full of body and warmth, without the brass. Nicky does it her way and I admire her for that because true authenticity can take you far. It's not like a 5* hotel experience or a VIP day out when you visit Nicky - she's set up at home because people are willing to come to her from far and wide. Leaving with a perfect blow dry isn't the goal (although for the record, it's really lovely), it's the colour that should be your deciding factor. If you want a 1;1 salon experience, this isn't it, but does it need to be? Nicky is clear in what is offered and if super light hair is your goal, you would either go a few times or leave with damaged hair in one trip that could be brassy and orange. There will be other girls there during the experience but it's because the demand is SO high. And this is Nicky's style; she's not a salon, she's a talented hairdresser who gets the work done. I'd happily skip the head massage, etc, as long as my hair is looking the best it can. And being part of the 'Nicky club' is so cool. I feel like I've bought a designer bag - I could survive without one, but it just feels like it has that extra sparkle, even 6 months on. It really gave a confidence boost, not only from the results I was so pleased with but from the experience in general. Will I be back? Yes! Hey all! Last year I had a fabulous time at New Square Shopping Centre in West Bromwich, which you saw in my vlog below. It was awesome to hang out with style guru Emily-Jayne and rush around the shops in a fashion frenzy to choose an entire outfit under £150, and it was featured in the local paper; so many people at work randomly saw my face in there! It was around that time that I really got my fashion mojo back and started to dive into trends again - something which I'd paired back as minimal, chic dressing had it's flash in the pan. And now it's all change again! There are SO MANY trends up my street this season, especially chokers, off shoulder cuts, a-line skirts, applique denim - the list goes on! Put 11th June in your diary as New Square are hosting a Pop up Fashion Show with this season's trends being modelled and plenty of prizes to share out - oh yes! I'll be stopping by with my vlogging camera to see the stylists and check out the showcase myself too. Luckily I have a prize right now of a massive £100 gift voucher to give away to a lucky gal or guy to spend at ANY store! That's Topshop, River Island, Primark... the list goes on. Simply enter below for a chance to win before 12:00AM 11/06/16 .